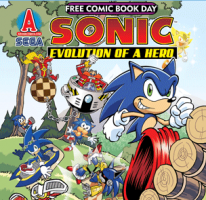 Though linked to previously, TSSZ News is now hosting for your consumption better quality images of the Archie Sonic comic preview for Saturday’s Free Comic Book Day. Archie’s Sonic blog preview of Sonic: Evolution of a Hero is hosting most of the imagery, but as of this publication there’s been a bit of a mixup on Archie’s official posting where only four of the usual six images are available. TSSZ News has obtained all relevant images posted and we have them below. Here’s Archie’s official synopsis of the 32 page special, which will be out in stores beginning Saturday, for free. Sonic the Hedgehog speeds into action in this special edition! Here’s your chance to take a look back at the long-running hit comic series that has been thrilling fans for over 15 years! What’s the connection between Sonic and the Freedom Fighters? Who are Shadow the Hedgehog and Knuckles the Echidna? What’s the deal with that Robotnik guy, and what’s going on in the series now? You might even get a special sneak-peek into the world of Sonic after the epic issue #200. Whether you’re a new reader getting up to speed or a veteran enjoying a trip down memory lane, this is one issue you just can’t miss! Fan-favorites Ian Flynn and Tracy Yardley! bring the fast-paced excitement to life.